Frank Chambers was looking for a peaceful moment as he strolled through the noisy holiday exhibits at the New-York Historical Society Museum & Library on a recent December afternoon. “I love the antique trains that are running through the first floor of the museum and the bells and whistles of Christmas, but I think I was getting a little overstimulated,” Chambers told Catholic News Service (CNS). “Maesta” means Madonna and majesty. It’s being shown for the first time with two double-sided wings, said Roberta J.M. Olson, curator of the exhibit, during a recent interview with CNS at the New York museum, on the corner of 77th St. and Central Park West, Manhattan. 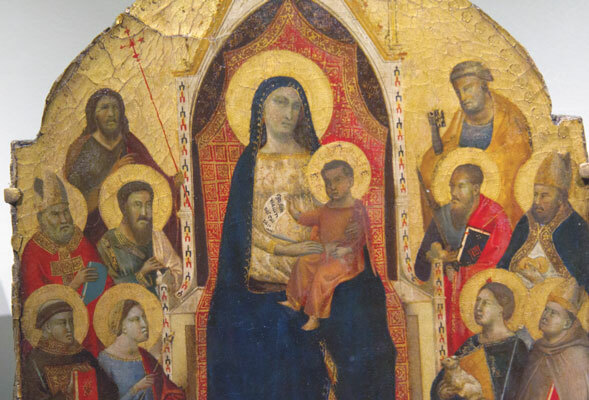 The central panel of the 14th-century Florentine triptych – the “Maesta” has been on display in the past. The wings had been in storage in a private collection and Olson, along with researchers from the J. Paul Getty Museum, were able to connect them to the Gaddi “Maesta” through physical features, iconography and other details. The 13-by-9-inch triptych would have been used in a private home by a Florentine family for their devotional practices and the side panels would have been folded up when it was transported to a country home or on other travels, she said. The exhibit of this newly reunited work is set up to simulate a private devotional space in a Florentine home. The triptych is painted in tempera, gesso and gold leaf featuring Mary and Jesus flanked by 10 figures, including St. Peter, St. Paul, St. Agnes and St. John the Baptist, patron saint of Florence. The shutters feature scenes of the Annunciation, Nativity and Crucifixion. “We are so pleased that our Renaissance jewel is home after conservation, with the added thrill that we can now imagine it as the artist originally intended,” said Louise Mirrer, president and CEO of the New York Historical Society. “As New York’s first museum, we are proud stewards of works gifted by pioneering connoisseurs like Thomas Jefferson Bryan, whose foresight allowed such masterworks to be seen in New York,” she said. Bryan was a renowned 19th-century art collector and left much of his collection to the New York Historical Society upon his death in 1870. Other works from the Bryan collection are featured in the “Maesta: Gaddi’s Triptych Reunited” exhibit, which will be displayed at the museum until March 20. The museum’s website is www.nyhistory.org.